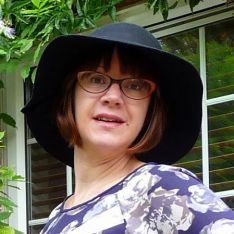 I’m pleased to say I’m back as part of the Minerva Crafts Blogger Network for a few months sharing some ideas on how to create Ready to Wear garments yourself using commercial patterns and fabrics from Minerva Crafts. You might think “why not just buy it?” and you’d have a point, but when I tried it on it didn’t really fit that well and I knew I could do something better myself, using (now out of print) Vogue DKNY V1488 as a basis. I browsed the Minerva website and found some lovely cotton/viscose Check Fabric, while darker in colour than the inspiration dress; I actually preferred it to the original. I’m pretty pleased with how close I managed to get to the original, although that wasn’t without some frustrations and several moments where I thought the project really wasn’t going to work. To start with I changed the round neck to a V, and omitted the collar. My neckline is finished with bias tape on the inside. Then I completely disregarded the grainlines marked on the front pattern pieces. To create the tie and draping the pattern pieces are a weird shape cut at an angle so that the grainline changes at the level of the tie. The pattern has you place the skirt part on the straight grain and the top on the bias. I decided to swap this around, as I’d already thought about making the yoke on the bias grain. Of course I didn’t think until after I’d cut it out about how that might affect the fit of the bodice. The bodice did end up slightly tight across the upper chest, but I’m not sure if that was because of my change to the grain or because I cut a size too small there. I managed to fix it by reducing the seam allowance at the armhole to 10mm from 15mm. The back of the dress has no shaping at all, and when I tried it on near completion it looked a bit sack like on me. I had fabric pooling at the back waist, which is a common problem for me as I have quite a pronounced swayback. I fixed this by adding some elastic in a casing which was topstitched in place. The sleeves were a work in progress, and actually turned out almost exactly like my original inspiration. The pattern has short sleeves with a turn back cuff which is cut as one piece with the sleeve and buttoned tab. I knew that coming into Autumn I wanted longer sleeves and I was considering doing full length with a cuff. I’m not quite sure when or why I changed my mind, but I ended up cutting the sleeves about 8 inches longer than the original pattern piece and adding turn back cuffs cut on the bias. I used the original sleeve tab pattern piece. The Buttons I used are lovely square mother of pearl ones and I couldn’t resist sewing them on at an angle rather than straight. I was luckily able to get the dress on and off over my head so I didn’t need to make buttonholes – I just sewed the button plackets together on top of each other and then stitched the buttons through all the layers. If I had realised at the start I wouldn’t need functioning buttons I’d have cut the front slightly differently, as the plackets are quite thick, particularly as I interfaced them to stop the bias stretching. I also stabilised the shoulder seams with strips of iron on interfacing for the same reason. This project wasn’t without its trials and tribulations, as well as the issue with changing the fabric grain that was self inflicted, I found some of the pattern instructions a bit hard to follow. I’m still not quite sure how I was supposed to finish the bottom of the buttonhole placket; I don’t think it should have been done the way I did it, but it works and is actually largely hidden by the tie. Since finishing this dress the weather has pretty warm so it hasn’t been worn yet, but I can’t wait to put this on with a pair of thick tights and some ankle boots. The fabric is gorgeously soft and cosy.